Geena Brown holds a BA in The History and Theory of Contemporary Art from San Francisco Art Institute and has completed coursework in Art History and Fine Arts from The American University of Paris. Geena is Executive Assistant at SZ | Advisory as well as the Arts Program Associate at the American Jewish University. Her aesthetic interests lie in early 20th century modern movements and post-war contemporary with a particular appreciation for emerging local artists. She is currently earning a certificate from NYU, Guggenheim Bilbao and Deusto University, Bilbao, International Leadership Program in Visual Arts Management. While Los Angeles has been a major cultural hub for years, over the past decade, it has truly burgeoned as beacon paramount for artists. With its warm weather and larger studio spaces, the city has lured artists and gallerists alike. Besides the incredible array of institutions – be it the Hammer Museum, the Getty Center, MoCA, LACMA, or the newly minted Broad – there are a slew of galleries to visit with dynamic programming year-round. Because of the sprawling nature of LA, it isn’t easy to pinpoint a city center; it’s best to survey the city by neighborhood. Hollywood, in particular, has seen an influx of new spaces: Matthew Marks has expanded to add another space in addition to their Ellsworth Kelly-designed showroom, legendary light and space artist James Turrell designed the expanses of Kayne Griffin Corcoran with stunning skylights and luscious landscaping; Regan Projects moved into a colossal storefront; Michael Kohn scaled up, and Various Small Fires and David Kordanksy built out impressive spaces, as well. Similarly, Downtown has seen a swarm of spaces spring up. Most excitingly, Hauser Wirth and Schimmel unveiled its 100,000 square-foot gallery, complete with community garden, restaurant, bookstore and teaching facilities. If you happen to venture West, LA Louver is a bastion for some of today’s Modern Masters: from David Hockney and the estate of Ken Price to Leon Kossoff and Richard Deacon. There is always, of course, Gagosian Gallery, as well, with successive blockbuster shows in Beverly Hills. Offering insider access, she tailors tours for her patrons ranging from gallery tours to museum tours, to private studio visits with local artists. She enjoys sharing her love for the arts and thirst for learning with others and encourages the support and collecting of emerging artists in her hometown of Los Angeles. This laid-back wine bar is the perfect Friday night spot to unwind and enjoy conversation with friends. They host pop-ups with up-and-coming chefs, weekly tastings, and their regular menu will leave you perfectly satisfied with upscale bar bites. Specializing in natural wines, you can depend on finding your new favorite bottle here. My safe haven. 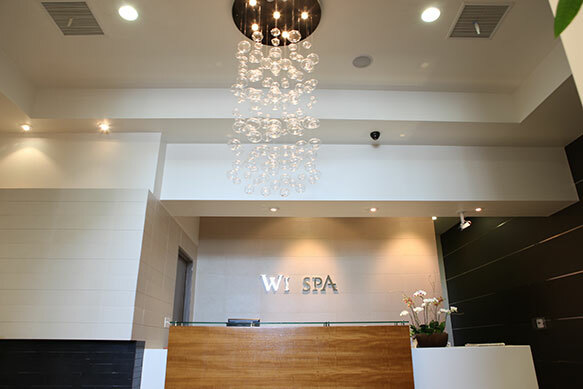 Between the burning hot and icy cold tubs, the clay sauna you can bury your toes in, the heated floors, and the spicy Korean rice cakes, WiSpa is a transformative escape from the chaos. It’s the perfect spot for shedding away both physical and mental excess, leaving you re-centered and relaxed in an almost dreamlike state. As a long-time follower of Maurice Marciano’s collecting, it has been even more thrilling to watch his renovation of the Freemason’s temple on Wilshire as the new home for the Marciano Art Foundation. The thoughtful and always relevant exhibitions bring together contemporary works that are a true reflection of the international contemporary art scene in an unprecedented way. Having lived in Paris and moonlighting as a home baker, I am a tough critic when it comes to baked goods. Proof Bakery in Atwater Village does not disappoint. Go for the baguette sandwiches, perfectly balanced with the right amount of crunch, chewiness, and topped with my favorite Maldon sea salt. Don’t leave without a creamy cappuccino and something to satisfy your sweet tooth - I have yet to go wrong! It is truly shocking I have not walked out of here without adopting a dog yet. This quaint storefront on Fairfax is a shop for everything dog-related, and more importantly a rescue center that places adorable pups in their forever homes. After breakfast or a stroll through Melrose Trading Post, I love to pop in here to get in some good puppy snuggles. These ladies work very hard for an amazing cause.